White Translucent Vellum Card Stock 48 lb, 8 1/2" x 11"
This translucent vellum is a heavyweight card stock vellum. Please note that the item CAN ONLY BE PRINTED PROFESSIONALLY. It CANNOT be printed using inkjet or laser printers due to the smoothness of the paper. 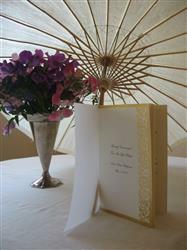 These items are often purchased together with this item: White Translucent Vellum Card Stock 48 lb, 8 1/2" x 11". Click the right arrow (swipe on mobile) to view more items. It's perfect for my needs. Very very good. I referred you to my friend Pam who has purchased from you after I did and showed her my paper. Just what I needed for my project. The vellum card stock paper was sturdy and printed on well. I ordered this vellum as part of my niece's wedding paper selections. The fact that Paper and More let me order 'one piece' to do test prints was perfect. Otherwise I might have been too nervous to try it. It prints beautifully! I just placed our formal print order for this and other supplies.